Today’s wired generation may sing “Oh, What a Beautiful Morning” from the musical, Oklahoma, in the shower without ever having the family name Hammerstein cross their minds. However, without the efforts of the Hammerstein family, not only would the brilliant and iconic Broadway musical Oklahoma not exist, we most likely would also be without the theater corridor known as Broadway and the crossroads of the world known as Times Square. 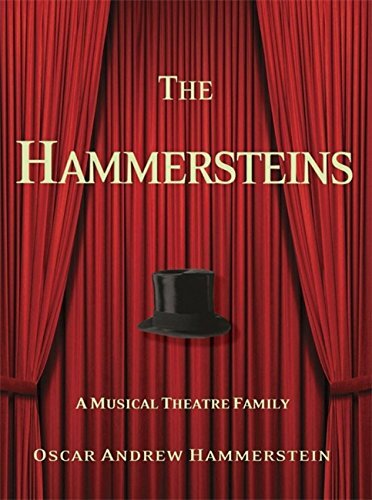 The “impact of three generations of Hammersteins” on musical theater has no equal, according to family historian, Oscar Andrew Hammerstein III. The author, grandson of Oscar Hammerstein II, the lyricist of many of the most enduring American musicals (Oklahoma and Showboat among them) traces the intertwined histories of his illustrious family and American show business. Author Hammerstein is proud of his family, but seldom loses objectivity in his smoothly flowing tale. He is not shy when it comes to revealing both the triumphs and the foibles of his great grandfather and grandfather. He seems confident of their place in history and aware that their blunders and less-than-charming sides will never diminish their stature. In fact, the author delivers his tales of scandals, failures, bankruptcies, and monumental successes with equal relish. We see the author’s great grandfather, Oscar the First, an immigrant cigar maker and inventor, turn his substantial profits to the service of music and theater. His personal sense of grandiosity, often bordering on hubris, drives him to build some of the largest and best equipped opera houses New York, or in fact America, had ever seen. Some of his extravagant efforts left permanent marks on the performing arts in his adopted country, while others rose and fell as best forgotten fiascos. Among his achievements was the construction, on the very muddy intersection of Broadway and 7th Avenue in New York, of an entertainment area known as Longacre Square. The name was changed to Times Square when the newspaper of that name built its editorial building and tower on the spot. The entrepreneur’s sons, Willy and Arthur, took over the family business and booked acts to fill their father’s monumental theaters. In the process, they helped the careers of such stars as Al Jolson, W. C. Fields, Harry Houdini, Charlie Chaplin, and Will Rogers. If the lineage had stopped there, the impact on American culture would have been valuable and enduring. However, the creativity genes showed no signs of stopping. Willy’s son, Oscar, II, was, as previously mentioned, the songwriter whose lyrics are among the best known in the world. Author Oscar Andrew Hammerstein rolls two centuries of historical facts and anecdotes into his compact and interesting book. The book is a jaunt through time, a fascinating tour of the innovations of the four generations (we don’t dismiss the author’s own father, contributing on the business management side) who put the name Hammerstein in lights for so long.